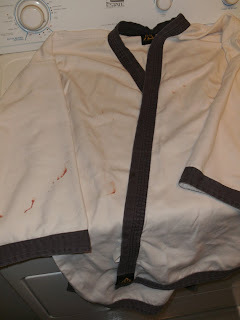 I’m already planning for tonight’s lesson after studying some online one-step sparring videos. I can’t believe the wide variety of style differences purported to be all TSD. Never the less, I found a lot of ideas and grabbed one I like.During Tuesday’s class Teacher and I hastily pulled together a lesson for the second hour during the rest break. I threw out a couple of ideas and we ran through the evolution of exercises that would lead up the final execution.I’ve always enjoyed how he takes a few basics moves and tied them together. We tried that with a wrist grab into a lock and submission. We broke it into small parts and tried to tie that together. Only this time I was explaining everything and using Teacher as the Uke. Sweet. After the lesson everyone applauded. This was from way back, but I wanted to show it again. Keep up if you can. Class Tuesday was fine and went quick. I didn’t develop any particular insight into my own skills, but settled in and just participated and taught when asked to. The newest folks don’t hesitate to ask me on technical matters which I kind of like.So Teacher calls me up yesterday and tells me that he thought I was doing better with Teaching. We went into a long discussion about the various students and their skills. Unfortunately I still have a long way to go when it comes to teaching. Teacher has a spontaneous approach to what the lesson might consist of, but he’s been doing it so long a majority of his work is pretty flawless and everything dovetails nicely with the theme of the night. Mine stuff is pretty basic and pretty bite-sized. He ended the conversation with, “I noticed that you seem more relaxed when you’re teaching.” And that I need to count with more authority. I guess my quiet wheezing doesn’t motivate the class very well. Somewhere between yelping in pain and standing on my toes for the umpteenth time I began to grin. I had just experienced something naturally without thinking about it. In our 2nd hour I was teaching one our newest students, Cop, wrist locks and was being constantly interrupted by other students with questions about technique. It was then I realized I felt comfortable with educating someone else. Normally my mental experience is something on par with, “what if they ask me this A – I don’t know A!” and so on, but last night I was able follow my own track so I knew exactly where I was going and just stick to those things.In retrospect I wish I had a laminated card so I could go over the techniques (wrist and shoulder locks) in some semblance of order. I feel like I confuse the students because I’m often dredging up memories instead of focusing on the technique at hand. Teacher asked us a question, “what’s the difference between a professional and a Master?” I was about to spout out, “the pay,” but held my tongue. I can't believe that so much time has gone by since the last post. At least I'm going to class regularly again, but (I'm having a hard time remembering to post the next day and then class comes up again and I forgot what I was going to write about. After I got back from vacation I was in for a surprise. Teacher warned me, but I still couldn't believe it. Our class ranks have swelled unbelievably. For the first time our class has a consistent number of members (around 14). In repsonse Teacher has stepped up his game on teaching. He's become more concise, more timely and impressive in his ability to match the class to the general skill level of everyone. I find myself a bit bored and then force myself to focus on my form and movement. The classes are flying bye at incredible speed. So the attacker comes in with a punch, you do a cross block into grab (so you end up holding their right hand in lock with your right hand; standing behind the arm standing next to them). Then you hold their locked wrist, and brace their elbow across your chest. You take your left hand palm their jaw. Holding on that annoying pressure point. Without fail when this is applied to me I'm in so much pain I can't breath. Without fail I haven't been able to apply to this anyone but someone my own height. So Sister1 and I are partnered practicing this. During the demo I was unable to strike teacher just due to the lockout and position. I get Sister1 in position and ask her to hit me with total conviction that I have her locked up tight. By my last post I can see that time has gone by a lot faster than I anticipated. If it hasn't been work it's been school work slowly eating at my ability to get to beatings. My muscles are so flaccid it makes me nervous to go because that's when the injuries seem like they occur (this is a lie - I find they occur when I'm feeling at my best and things get out of hand). Tonight the worst was when I was thrown the newer folks let go my hand and I'd get dropped unceremoniously on the mats. Not cool on the backside. I got partnered with Nilon at one point and missed the block which led me to a punch in the ear - ouch! Later I unintentionally popped him in the jaw -oops. I mean, I felt bad and all, but I'm celebrating now. Let's say that everything has a tempo. I find patterns instructive and powerful tools for learning especially within beatings. For practice, getting a rhythm going just seems to create an expansive, hypnotic feeling. It's where you can let go of what's going on, step outside of yourself and look at what's going on in an objective fashion. Of course, I realize that this same pattern is the direct cause of problems in sparring or other one/two step applications because it builds up an almost neural pattern - a trap of repetitive training. Last night I realized that without Nilon we established an otherworldly tempo of counting during the warm ups. Even if everyone finished the move at a different time the counting was always on the mark. I had to leave class immediately. I had to leave class immediately or I might have burst into laughter. I ran up the stairs with a rictus like grin - smiling so hard I thought I'd tear the skin on my face. Bob from Striking thoughts mentioned that guys like this will eventually have someone rain on their parade. Tonight the rain came and the only disappointing thing about it was that I didn't get to bring the rain. By the calendar it appears that a month has gone by since my last attendance to beatings. After a rich diet of beer and finishing other peoples meals for a month beatings was going to be hard. Thankfully everyone else appeared be doing about the same after the holidays. Things haven't changed much with the group. Still a plethora of teenage girls with some of our original gang. Teacher is out of a lot of instruction due to a rotator cuff problem - even punching is painful.